Small or large, short haired or long, kitten or adult...Tell us everything about your cat so that we can select the best products for him, which include yummy treats, toys, accessories and hygiene products. Choose a plan, we offer 12 months, 6 months, 3 months or 1 month subscriptions, it's up to you what you choose! You can choose to suspend the subscription at any moment. Boxes are sent each month towards the 10th, you receive them between the 15th and 25th of the month. Your furball will be ready for hours of fun with playful toys, tasty snacks and all in all you will have a very happy kitty! 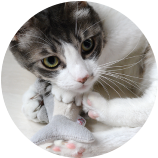 Every month, 6 products which are adapted to the profile of your cat will be delivered to you in a single click. Toys, treats, accessories, healthcare products: the team only choose the best to ensure the most excellent experience! Savings: receive over £40 worth of products for just £19.90 with free delivery! You don’t need to break the bank to treat your pooch. Do you fancy sharing a special moment with your furrball? You have come to the right place! We have the perfect treat for you to share every month! Can you imagine the look of excitement on your dog’s face when she receives her first Purrfectbox? 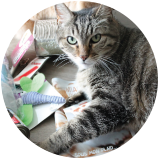 The products are hand-picked by our team to guarantee your cat hours of fun, mouth watering treats and health products to keep her in top notch condition, all sent directly to your letterbox!